Weight: 37.5 cl. glass bottle. Description: “Vin Santo del Chianti Classico” is a raisin wine produced in the provinces of Florence and Siena. 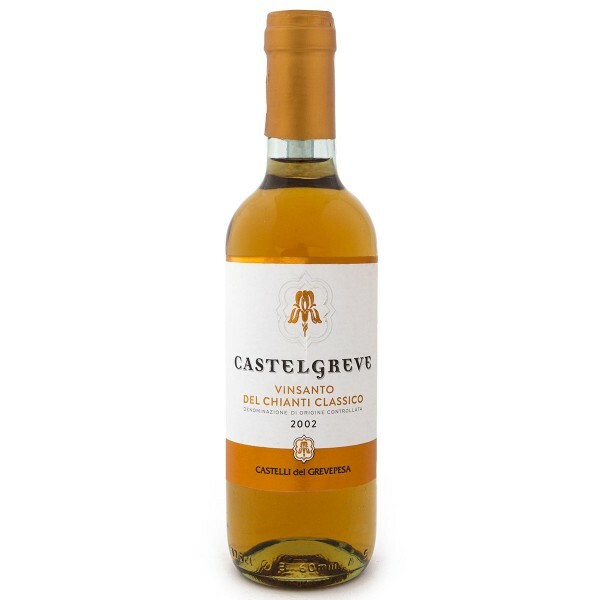 It is golden yellow in color with tones of amber and a fragrance reminiscent of almond and dried fruit; its taste is warm, harmonious and captivating. It is harvested by hand, leaving the grapes to wither on special cane mats and ferment for at least 48 months in small oak “caratelli” (barrel-shaped wooden pots). Serve for dessert at approximately 18°C, together with classic"cocoa and hazelnut"and"pistachio nutsand chocolate" Cantucci from Tuscany, or with fruit in syrup. Producer: Castelli del Grevepesa Sca.